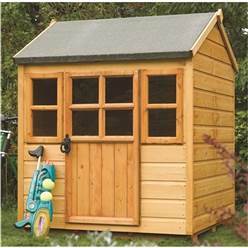 The Playhouse range start from 4ft x 4ft and go up to the grand size of 8ft x 6ft – extremely roomy for small children. Our range also features a sandpit which measures 4ft x 4ft bringing the beach to your back garden. 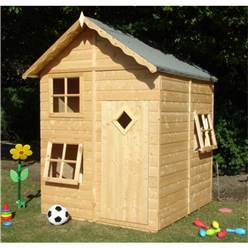 Our playhouses differ in shapes and sizes with some including a swing, a slide or activity set. 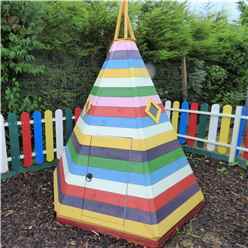 Or if you require something really different, you should take a look at our ‘Superior WigWam Playhouse’. Many of our Playhouses are like miniature adult Summerhouses with a veranda and windows with Georgian bars which really makes them look perfect. We have some playhouses which are set higher up which we call a ‘Tower Playhouse’ which you can gain access by the ladder provided. 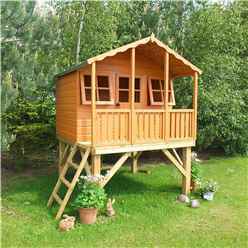 You could go all out and go for our Tower playhouse which includes an access ladder, swing and slide. You will have yourself a King and/or Queen of their castle. Included in our wide range of Playhouses is 2 storey Playhouses, so your little one could even have their own miniature house to give some of those many toys a home instead of your front room. Our Playhouses are all CE approved for safety and are manufactured to an exceptionally high safety standard to meet European Toy Standard EN71. Safety hinges are also supplied for the doors and windows to prevent little fingers being trapped and harmed. We recommend all our playhouses are used by children 3 years and over and that all children should be supervised at all times whilst playing, especially if it is a raised play structure. 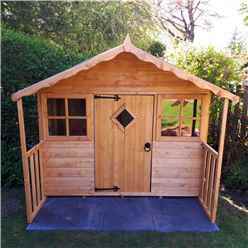 The playhouses are supplied pre-treated, however we recommend you treat the playhouse during or shortly after construction and then once or twice a year, every year, with a high quality preservative to prolong the life of your playhouse. Due to there being a large range of colour paints/treatments available for wooden outdoor buildings, you should be able to find the perfect colour scheme for the outside of the building, finishing off your new playhouse perfectly. What’s Is Included & How It Will Be Delivered? Each Playhouse comes with the full set of instructions, fully assembled pre made panels including pre-hung doors and a fixing kit with plenty of nails and felt to complete the assembly of your new Playhouse. Be sure to have an appropriate base for your playhouse, as even though they all include a floor, you will need to have solid, level, concreted or paved area to situate the Playhouse on to. This will prevent the wooden floor getting damp and rotting. If you don’t have a concreted or paved area, we do offer an Ecobase as an additional extra which is made up of plastic grids. You would simply need to lay down the membrane included where desired and lay the Ecobase on to and simply fill evenly with gravel – you will be all set and ready to go. The Ecobase grids are lightweight and easy to lay as each grid simply interlocks which the other. Due to it being made of plastic, it is completely Eco friendly and will last a very long time. Playhouses are the perfect outdoor accessory for kids. Invest in a good quality playhouse and your kids will have a place to store their toys and a focus for imaginative play for many years. 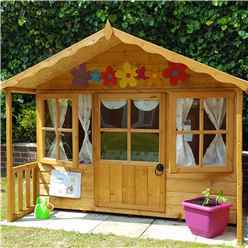 We sell a huge range of different playhouses for children, so whatever your budget, we can guarantee there will be one to suit your family. 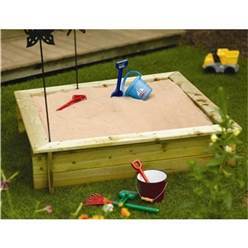 At the bottom of the playhouse range is our traditional wooden sandpit. Kids love to play in sandpits and playing with sand helps them to develop their fine motor skills as they dig, scoop and pour. A solid sandpit will last for many years and is heavy enough not to blow all over the garden in strong winds. 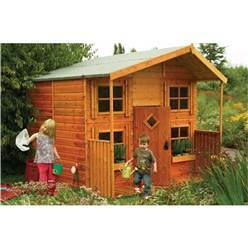 Small playhouses are perfect for one or two children. 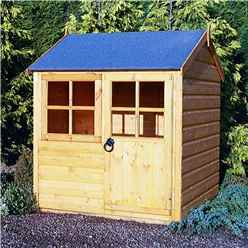 The basic design features a small playhouse with an apex or pent roof, windows, and a door. Choose from a natural wood finish, or paint your playhouse in bright colours. 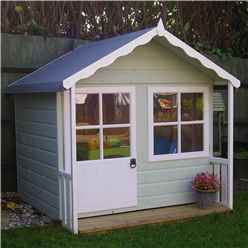 Some of the 5ft x 5ft playhouses also come with a porch area, which creates a small sheltered space in front of the door. This can be used to store toys or as a place to plant flowers in tubs and baskets. You could even plant climbing flowers so they grow around the porch and over the door. 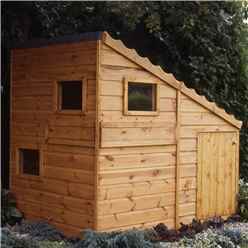 One of our more popular playhouse design features a tower house with a viewing platform. Kids access the playhouse via a short ladder and once on the platform, they can be a king or queen of their castle. Larger versions of the same design have a cute balcony with enough space for a chair and Georgian-style windows, while beneath there is enough room to store bicycles and other large toys. Another version of the same tower playhouse design has a ramp up to the tower platform and an enclosed area beneath. This might be a better option for younger children, as there is no ladder. Kids who love to play cowboys and Indians, or cops and robbers, will have a ball playing inside the lookout post playhouse. This design has a sloping pent roof with drop-down slots on the side, so children inside the playhouse can check out who is coming. The lookout post playhouse will feed their imagination and provide the ideal location for lots of exciting games. 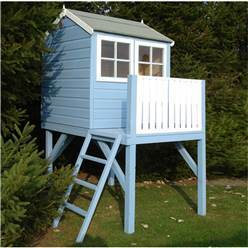 We can also combine the lookout post design with a tower playhouse, so your kids can enjoy the best of both. The barn playhouse has plenty of room for several children to congregate inside on a wet day. The playhouse is built in the style of an American barn, with an apex roof and small window above the large door. It’s big, light and roomy, and at 6ft x 6ft is ideal for larger families. Double storey playhouses have a mezzanine floor inside, so children can climb up to the second level via a short ladder. Kids will have lots of fun in their little house with cute window shutters and a door. They can use it for games, painting and craft sessions, or as a place to snuggle up with a blanket and a good book (although these days it’s more likely to be a blanket and an iPad). 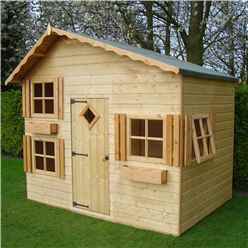 The barn playhouse is also available as a double storey playhouse – this version comes with an enclosed porch area. 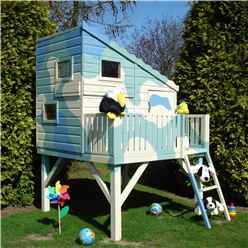 For a bit of extra fun, why not go for one of our excellent tower playhouses with an additional slide? Kids can climb up to the playhouse via a ladder on one side and then exit back down to ground level on the slide. 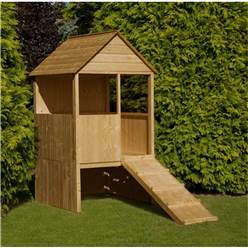 Alternatively, for even more excitement, we have a tower playhouse with a slide and swing set. Budget will probably play a significant part in the decision making process, but it is a good idea to invest in a playhouse that will grow with your children – especially if you have plans to expand your family. When you have more than one child, it’s worth buying a larger playhouse, for toys alone take up lots of room. As long as you take care of your new playhouse and treat it at least once a year with a suitable wood treatment preparation or paint, it should last until your kids have flown the nest. We know that choosing a kids’ playhouse isn’t always easy, so if you need a bit of advice, feel free to give us a call today.